Wil Wegman had his first newspaper article published in 1985 and a year later began writing a weekly newspaper column called the Great Outdoors for a Richmond Hill newspaper. For the next ten years he would write for this paper but his column also went into syndication and was appearing in other weekly’s in Newmarket and the Kawartha Region. He soon began freelancing for magazines and has had numerous articles published in such great Canadian magazines as: Ontario Out of Doors, Outdoor Canada, Bob Izumi’s Real Fishing, Big Jim's Just Fishing and all issues of Bassman Magazine. In fact he became editor of BassMan, and until May 2010 helped develop some of Canada's most intriguing bass related articles and columns thru this publication. American publications like In Fisherman, Bassmaster and BASS TIMES have also published Wegman’s work. He is the “Hooked On Fishing” columnist for Lake Simcoe Living Magazine and his articles can be seen on the www.lakesimcoeliving.com site. From 2006 until about 2009 Wil wrote a weekly newspaper column for the Georgina Advocate called Focus on Fishing. He is a regular contributor to the Toronto Sun’s annual National Fishing Week section and in 2006 and 2012 won a National Outdoor Writing Award for an article in that section. Numerous feature length articles written by Wil can also be seen on the popular www.fishonlineca.com site. He also contributes to www.timeonthewater.org Wil is a regular contributor to the Lures and Tours booklets and several Tourism Guides publish his articles on fishing Lake Simcoe. As an official BASS Press Observer, he covered Bassmasters Classic’s in the US as a Canadian writer from 1991-2009. As well as being a prolific and award winning outdoor writer, Wil is also a successful bass tournament competitor (since 1986) and has qualified three times for Team Ontario, representing the Ontario BASS Nation (OBN) at Bassmaster Divisional Championships in the US. He is also a prominent figure on The Bassmania Tournament Trail – which runs more competitive fishing events than any other organization in the province. 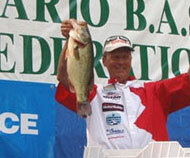 In 2006 Wil marked the 20 year anniversary of the bass fishing courses he teaches at Seneca College. His bass classes are accredited with introducing hundreds of anglers to competitive fishing through his bi-annual amBASSadors Cup Tournaments open only to students of the course. In 2007 he marked 20 years of teaching his ice fishing courses.Today he has put his bass and ice fishing courses on-hold to focus more on how-to seminars at various sports shows and other venues. His popular ice fishing seminars see him travel from Hamilton to Ottawa, north to Sudbury and many stops in between. Wil has been a guest on several episodes of Bob Izumi’s Real Fishing Show – including one that won the top award in the 2006 Outdoor Writers of Canada TV Fishing Show category... for an episode of Wil and Bob fishing the Toronto Islands. In 2008, he was on a two part Real Fishing ice fishing show filmed on Lake of Woods. Wil has appeared a couple a few times on Angler and Hunter television ... with all three hosts of the show since it's inception- Rick Morgan, Cam Brownson and most recently Mike Miller. He is also a frequent guest with Outdoor Journal’s Radio Hour on the Fan 590 and on Angler and Hunter radio. Wil was a member of Team Canada at the World Ice Fishing Championships in 1991 and has several top ten finishes in the Canadian Ice Fishing Championships. In 2006 he won the Perch Trap Attack on Lake Simcoe and in 2011 he and his son Izaak won the inaugaral MS Perch Tournament which saw 75 teams compete. Wil volunteered as the Conservation and Media Director for the OBN from its inception in 1995 until 2010 and has been a member of the Aurora Bassmasters Club since 1995. Wil has won Angler of the Year and Member of the Year several times for the club. As Conservation Director for the Aurora club, Wil has spearheaded several projects that benefit the environment and local fisheries. In 2013, those projects helped land four Conservation awards ranging from the Internationally esteemed Berkley Conservation Award to the more local Lake Simcoe Region Conservation Award. He is also a proud member of the Ontario Federation of Anglers and Hunters, Bass Anglers Sportsman Society and the OWC. · Frequent Fishing Seminar host at locations like Bass Pro Shops, Sportsman Shows, Fishing Clubs etc.